Why is it that we all love to be scared? And don’t try to tell me that you don’t. Just look at the popularity of horror movies. Vampires are multiplying on TV like rabbits. And need I mention Stephen King? Halloween, of course, is the prime holiday for being terrified. Witches and mummies and ghosts and pirates roam the streets and adorn our yards. The fun part is that it’s all safe and make-believe. I’m not going to get into those dreadful times that the fear becomes real such as when sick adults spoil kids’ fun by tampering with the candy. I’ll save that for another blog on another Halloween. I grew up in a rural setting surrounded by corn fields and cows. We NEVER got any trick-or-treaters here until my cousin built a house next door and her kids came over before heading out to prowl the more populated streets where their aunt and cousins lived. I remember one year, my mom put me in a Bugs Bunny mask and we went to visit an aunt on Halloween. I watched as costumed monsters (very SHORT monsters) appeared at her door and were gifted with small candy bars. I think I was maybe four at the time. Not only did we never receive trick-or-treaters, I never WENT trick-or-treating either. I feel so deprived. However, I developed a passion for haunted houses. My first one was at a friend’s house. I helped set it up in her basement before her Halloween party. Looking back, it was pretty mild. Jell-O and spaghetti in a bowl sort of thing. Yuck. Fast forward to my teen years when I was in 4H. I helped put together some fairly good haunted houses for the club’s annual parties. I even won a prize for scariest costume (Miss Transylvania 19-something or other) once. During my senior high school days, Campus Life put on Scream in the Dark every year and Washington Park had their Dark in the Park. Both were wonderfully spooky with chainsaw wielding ghoulies jumping out from behind caskets and mummies grabbing at you when you were busy eyeballing that vampire behind the tree. I thought my haunted house days were over until last week. My mom has been rehabbing from hip surgery at a nursing home for the past few months. This place is great. Their recreational department goes above and beyond to provide entertainment for the patients and full-time residents alike. When I saw that they were having a haunted house in the rec hall, I asked my mom if she wanted to go. She thought about it and to my surprise, agreed. In all of her 87 years, Mom had never been through a haunted house before. How scary could it be? I reasoned. They couldn’t make it too bad. After all, the patients and residents there are mostly OLD. They wouldn’t want to be responsible for anyone having a heart attack. Would they? Then again, they were just saying that all the beds were full. Maybe they needed to open up some space for those needing to come in. With Mom in her wheelchair, we waited in line with teenagers and parents with small children as well as a few other invalid patients. But mostly it was kids. I was getting worried. Apparently, the staff’s and residents’ families were mostly the ones taking part. What if this really was too frightening for my elderly mother? Well, we had a blast. I assume the actors dressed in the gory costumes played it up or down depending on who was coming through at the moment. But there was the usual haunted house line-up. Vampires, ax-toting bloody specters, large hairy spiders, mummies and some ghost pirates to name a few. We screamed and laughed and had a grand time being scared. Okay, time to share your favorite tales of being scared and loving it. And Happy Halloween! Boo! A massage client, Ellen, once told me of her daughter Kathleen's homemade Halloween costumes. She'd plan for months and rig up an elaborate rendition, using bolts of fabric and household items. Invariably, no one ever "got" what the costume was and Kathleen would be crushed. For instance, her last costume was a spirit guide. I must admit, I don't know what a spirit guide looks like and chances are, they all look different. I just think Kathleen's ahead of her time. Maybe I won't be a vortex for Halloween after all, but that reminds me of our trip to Sedona, Arizona not even two weeks ago. Diamonds amplify the positive, but also the negative, so you must be careful when you wear them. Can a vortex amplify the negative, too? We think so. My friend Judy lives in Sedona amidst the vortexes (or vortices, if you prefer). She first noticed trouble when her elderly neighbor Tom began cursing out loud to the plants in his garden. Then he progressed to yelling things like, "I'm going to kill you!" Judy feared he might hurt himself in this unreal state and tried to get him help. No mental health intervention was available. He could just be arrested and sent to jail. Then he came out at noon one day to hose down his garden, completely naked and ranting. I'm sure you're wondering--how big was his hose? The townhouse association (Wild Turkey Townhouses, no less) got him evicted and Judy says she's seen him in another part of town. Was it the vortex energy? We laughed at Judy's story until our last night at the motel, when we were awakened by loud banging on our door--at four a.m. Alan responded, and a nicely dressed, heavyset woman, hair immaculate, yelled through the door that we had to evacuate. "There's cyanide gas. You've got to get out. You'll be killed. I'm from the state police." By the time we got awake, we spied the manager outside and he confirmed our suspicions: "She's nuts. I called the police." I prefer to call it mental illness, but later we found out she'd banged on doors at several other motels both around us and seven miles away. The police got her into the squad car and took her away. (Was she wearing her diamonds, too?) We hoped she had family to help her with treatment. So while you're out trick-or-treating and thinking about the new novel, maybe you could throw in a vortex twist or two. Will you dress as an agent? Or maybe your favorite editor? I can't decide whether to be a medium or an Ascended Master. What will you be on October 31st? J.T. Ellison's debut thriller novel, ALL THE PRETTY GIRLS, is now available. She is the Friday columnist at Murderati.com and is a founding member of KillerYear, an organization promoting the best debut novelists of 2007. You can learn more about J.T. on her website at http://www.jtellison.com. Playing by the rules. We’re conditioned to follow the righteous path, to stick with the proverbial straight and narrow. Yet how many times have you heard of the person who broke all the rules, got the agent through a flamboyant attempt, landed an unheard of deal for a book that no one had ever thought to write? Writing workshops, conferences, blogs and listserves counsel new writers to always, always follow the rules. So why is it, when we hear the success stories, the rule breakers are the ones with the clout? Let me back up for a moment. Stephen King makes the excellent point that if you’re going to be a writer, you need to know the rules. The Writer’s Toolbox, he calls it, the fallback position for every writer. Vocabulary, grammar, sentence structure – all of these individual tools are essential to writing a good book. The trick is to know the rules well enough that when you break them, you’re doing it on purpose, for a specific effect. So when you have your toolbox chock full of every imaginable instrument, and you’re the Yo-Yo Ma of the dangling participle, what then? How do you know when to break the rules? How do you know that it’s okay to take a chance? SLAP! The glory, the creativity, the late nights watching snowflakes drift to the ground and trying to describe them individually, gone. Like a stupid, impressionable kid. I listened. I stopped writing. I still read. Depressed as only a thwarted writer can be, I secretly imbibed to excess on my favorite poets, wondered at their ability, knew that I’d never be at their level. Somewhere, deep down, I believed my favorite little bohemian was right. I wasn’t good enough. Damn it, I followed all the rules, and I just wasn’t good enough. Later in the semester, desperate for work to submit so I wouldn’t fail the course, I branched away from what the teachers were selling. I happened across a book by a man I’d never heard of. College is the time of discovery, right? The book was “HOWL and Other Poems,” by Allen Ginsberg. It knocked my socks off. I didn’t understand it, deconstructed and looked for the hidden metaphor, the meaning behind the words. I still didn’t get it. Then I just read the poems. I let the words be what they were, not a symbolic journey through allegory, but naked, hysterical truth. With Ginsberg’s irreverence flowing through my work, I finished my thesis. It garnered lukewarm praise. The tiny little bud of creativity I’d been nurturing went dormant. I’m ashamed now to admit that after my dismal last semester in school, I did focus on my other studies. I went into politics, had a nice career, moved into marketing, had a nice career, lost my job, moved to a new state, was bored to tears. Started to read again, really read, the way I’d done in college. Reading to learn is much different that reading to entertain. And these new writers I discovered weren’t following the rules I knew. Well. We’re making progress, I think. I chucked it all then. Threw out every single damn rule I’d been taught. Wrote the book I wanted to read. Wrote like the wind. That one got me an agent, but didn’t sell. Timing this time, not any fault of mine. Instead of pulling back, I did it again. That one sold. Don’t get me wrong. I don’t think I’m changing the course of humanity with my work. But I’m writing for me. I’m writing that tone, that voice that so disturbed my professors in college. They called it B-grade detective fiction. I call it a thriller. Stuart Woods told me once, “The only rules are those you create, page by page.” That one sentence was better writing advice than anything the professional teachers ever gave me. So know the difference. When an agent asks for a submission on green paper with 2 inch margins and courier font, you sure as hell better listen to them. But when your heart and your soul are telling you to try something different, to break the mold, to throw caution to the wind, listen. Listen, and succeed. Today I finished rewrite number three of my current project. It's a novella, my second now, and it's about to go into a tiny and very short limbo while my critique group colleagues give the first three chapters some scrutiny. That's about three weeks from now and it's possible I may find a significant rewrite is in order before part two can be submitted. It's also possible I'm on the right track and comments will be relatively easy to fix. Being as optomistic as possible means the novella will not be taking up significant portions of my time for the next several months. My first novella is in a larger limbo having been submitted for a contest; it'll be several more months before I decide if that needs more work. In the meantime I'm left with a choice: look forward or look backward. I have a collection of short stories that I haven't touched since January 30, 2006 when I compiled them into a spiral-bound book. I read portions of it earlier this week and I found myself no longer as impressed with them as I was when I printed them out. They need work. But is that where I should focus my efforts? During my last vacation, a cruise along Alaska's inner passage, I had the opportunity to hear two speeches given by a retired Royal Canadian Mounted Police officer about the history of that organization and it has inspired parts of a mystery - namely main character and setting. I have no idea what the mystery would be about. Is that the next project for me? About a year ago, I saw a movie that gave me lots to think about - though not what the filmmakers meant, I'm sure. It was a dystopia - a story set in a significantly less than perfect future - and it got me to thinking: why aren't there any dystopian comedies? Dystopias are such downers you'd think someone'd be itching to make a funny one. I came up with many, MANY ideas for such a book - is it time to take a stab at it? Last year I found a television show I could really get into - namely, Heroes. It's the kind of show I'd like to write. One night after watching a marathon, I thought of a story arc that I think would make a pretty good season. 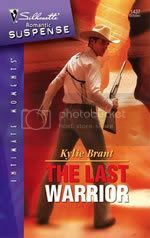 While I don't have any hopes of selling it to Hollywood, television shows of the sci-fi genre do tend to have spin-off novels. Star Trek and Star Wars each have several hundred, and I've seen them for Quantum Leap, Babylon 5, X-Files and even Deep Sea Quest - just to name a few. Is this something I should pursue? Then there's my very, very first attempt at a mystery novel. Man, does that bad boy need work. It needs a complete overhaul in plot, characters and pacing. Has my progress with my other works prepared me to tackle that problem child now? There's even a thriller I've been mentally playing with for a couple years now that I think has strong possibilities. I haven't plotted it out completely yet but I think I know pretty much how it'll go. Is now the time? I should, and do, feel blessed that I have enough ideas to keep me in front of my computer for several years to come. I also know how I'll ultimately handle this decision - I'll let fate decide for me. I'll write all the titles on strips of paper, fold them and draw one out of a hat. It's a process that's worked well for me in the past - most of those short stories were written in the order fate dictated. But I'll not choose today or tomorrow. I'm going to enjoy this weekend. I'm going to enjoy imagining all the possibilities. It's fun to wonder what's next. So, I'm still clawing my way to publication--a path pitted with moments, okay days of self-doubt. However, I'm not alone in worrying about whether my work will ever feel its spine crack open to let a spray of sunlight warm its innards. I'm told that many who are published never feel a settled, sense of peace around their success. They don't experience the calm realization that their next idea or actual book is a sure thing and they often state they recongize the path they're on may shift or reverse at any point. Reading Newsweek I came across an article about the new biography of Charles Schulz, creator of the Peanuts cartoon empire ("Schulz and Peanuts: A Biography," by David Michaelis). It seems we can add Schulz to the list of artists who even in the throes of success doubted he was actually experiencing it. While there are many biographical details disputed by Schulz's family--nice guy or not, good father or not, generous or not, you know the way these things go-- his attempts at cartoon publication seem pretty straightforward. According to the article, Schulz's first attempts at publication date back to his high school days. You'd think his high school cohorts would have begged old Chuck to contribute his work. Nope, nothing, shot down, no thanks, see you later. Next, according to Newsweek, Schulz started submitting cartoons to Colliers and Saturday Evening Post. REJECT. Disney didn't merely reject him, they offered him a very helpful critique stating he was "unqualified to work as an animator." Finally, in 1947 while working his day job, Schulz published a cartoon which was picked up and started him on the road to success. Well, not if you asked old Chuck, I guess. He was competitive and depending on who you asked he was either helpful or spiteful to fellow cartoonists. The condition of insecurity seems to be traced back to Schulz's childhood and the way it's woven into his cartoons and daily life, was evident to many he knew. Beyond the aspects that interest me most--the way an artists work isn't valued until the right people put their stamp on it--I am intrigued by Michaelis's insights into events and actions that defined Schulz's life. Some interpretations seem off-base and I can see why the family might be pissed. On the other hand, perhaps the biographer is just the objective eye needed to fully illuminate the life of a man who gave the world a daily jolt of laughter. So, to all of us, published and not, hang in there. It'll happen, it'll happen, it'll happen...and when it does, here's to having the perspective to recognize the achievement for what it is--Fantastic! Leslie Mollett was convicted of first degree murder yesterday in the slaying of Corporal Joseph Pokorny on December 12, 2005. Now the jury must determine whether Mollett lives or dies. The fact that Cpl. Pokorny was on his knees with his hands in the air when Mollett fired a shot into the back of his head will be pivotal in these deliberations. I don’t think I have to say where I stand on this. This case has been riveting from the very beginning. From the video of the crime scene to the actor’s stand off with police days later. From the audio tape of the traffic stop to the courtroom packed with everyone from drug dealers to state troopers. No less than six people were arrested during the trial, the most recent one yesterday (for intimidating the jury). The prosecution presented over 337 exhibits and 67 witnesses. There was overwhelming evidence which included Pokorny’s blood and DNA on Mollett’s cell phone and inside the car he was driving. A forensic pathologist detailed the agonizing last few minutes of Pokorny’s life: How the first shot entered the side of his chest and went through his lungs. How he then fell to his knees with his hands up in the air. How the next bullet—shot from 3 to 9 inches away—hit his left ear, fractured the base of his skull and went through his neck. The defense attorney attempted to refute the evidence. In the end, though, the defense only called one witness who was quickly cut down by the prosecution. The defense attorney's closing argument was only 45 minutes long, where he stated, “The law shields us from the intimidation of a police state. What stands between us and anarchy is the law.” He tried to make the point that the dozens of state police officers in the courtroom were there to intimidate. It didn’t work. Rest in peace, Corporal Pokorny. Justice has prevailed. Members of an on-line group I belong to sometimes refer to seeing each other face-to-face as meeting in the "meat world." As a vegetarian, I feel a little awkward about "meat," so it may come as a shock when I tell you that I've held a lot of jobs that required working with meat. The meatiest of them all was Arbys. This was the late 1960s. Arbys was trying to distinguish itself from the hamburger joints by touting the fact that it served real sliced beef on a bun, not shredded beef like its competitors. Arbys' employees were all males, and they wore brown-and-yellow plaid neckerchiefs and tall yellow chefs' hats and looked as if they should be standing over a roasting steer with a carving knife. I was one of the first women to work for Arbys in the Pittsburgh area. The job had been posted in the student employment office at Pitt, and I happened to apply the same day that the manager had had a visit from the Human Relations Commission. He needed a female employee, fast. I got the job but I couldn't wear the hat -- all the hats available were too big; they kept sliding down over my eyes. Arbys had rules. Employees had to sign a pledge not to reveal the roast beef secret. [To the best of my recollection, preparation of the signature dish consisted of taking it out of a cooler and putting it in an oven.] Unlike a standard restaurant where the staff might approach a customer with, "Can I help you?" or "What would you like? ", we were required to say, "Arbys, sir?" or "Arbys, ma'am?" To which all customers would universally respond, "Huh?" I never tried the roast beef, but a lot of people seemed to like it. The real draw, though, was the eggnog. Well, not the eggnog, exactly. Arbys supplied shakers of nutmeg to sprinkle on the eggnog, and the local heads had discovered that, in sufficient quantities, nutmeg will get you high. It was not unusual to watch these freaky people dump a tablespoon or more of nutmeg into a single cup of eggnog. I never tried that either, but I kept refilling all those nutmeg shakers. I also found myself in the middle of an awkward situation. Like many restaurants, Arbys routinely provided police officers with free coffee and half-price meals. This is not a bribe. It's just a subtle way to stave off potential robbers, who are less likely to hit a place where they see police going in and out. The Arbys I worked in was located near the Allegheny County Juvenile Court and the sheriff's deputies who transported and guarded prisoners would sometimes come in for lunch. We treated them like any other law enforcement personnel, until, one day, a sargeant came in and ordered about 40 sandwiches to go. The manager whispered to me to charge him full price, which I did. Boy, was he mad. Years later, when I'd finished law school and was trying cases in Juvenile Court, the other deputies were still laughing about it. I can’t say there’s a nip in the air – the temperature registered 76 degrees yesterday and I’m still sleeping with my window open – but we are cruising toward my absolutely favorite holiday of the year – Halloween. Oh sure, Christmas is great with all the presents, but really, who needs a set of monogrammed pillowcases that will only end up on the church bazaar linen table anyway? Give me Halloween, when I can eat Baby Ruth candy bars guiltlessly and watch my male friends parade around wearing wigs, dressed in their wives’ clothing. The shyest of kids reveals their true inner nature when he quietly states that he wants to be dread Lord Vader this year and tom-boy decides – for the first time ever – that she wants to be a fairy-tale princess. In Aspinwall, PA, Halloween is a big to-do. Eleven years ago, when I bought my house, the owners warned me about the landscaper at the end of my street – each year Mr. Halloween buys a great pumpkin that draws every trick-or-treater in a four township radius. I go through 260 pieces of candy annually, no lie. Last weekend, I stopped by to check on things and Mr. H was staying true to form: this year’s specimen weighs in at 672 pounds and he needed a forklift to lift the pumpkin up onto his front porch. However, the in-town competition is heating up. This past summer we welcomed a new neighbor, a transplanted Frenchman who is embracing this most American of holidays (come on, be honest, does anyone really like Thanksgiving?) We’ve been hearing a lot of hammering coming from Monsieur’s garage lately, and last Sunday he unveiled his masterpiece by transforming his porch into a fully-fledged pirate ship complete with ghostly crew and a working gangplank. The poor headless skeleton I hung in my dogwood is looking a little beat by comparison. I may have to break down this year and buy that fog machine. The best part of Halloween, of course, is the kids. I am not kidding when I say that on October 31st, from 6:00 to 7:30 PM my street looks like Mardi Gras. I’ve got hordes of shrieking Ninja turtles and gangly, teenage Goth monsters who I’ve know since the day they were born. Some of them may be a little old for Trick or Treat, but what the heck, if you play, I'll pay. Several weeks ago I wrote about Elizabeth Jane Gardner, an American painter working in Paris in the second half of the nineteenth century. You may recall that Ms. Gardner disguised herself as a boy in order to take a drawing class. I confess that I didn’t finish the story that day in effort to lure some of you to attend my gallery talk. I promised those who are letting earning a living get in the way of attending my gallery talks that I would give them the ending. Elizabeth received her permit to dress as a boy from the French government, and continued to go to the drawing class wearing pants. Even after her fellow students found out she was an imposter, she was able to continue to draw with them. Her bold behavior was one of many indicators that it was time to level the playing field for male and female art students. Elizabeth Gardner enjoyed a fifty-eight year long career as a painter in Paris (be still my heart). For an American woman who arrived in France almost penniless in the 1860s, this is astonishing. She exhibited at the Salon numerous times, and she actually earned a living as a painter. To what did she owe this success? Ms. Gardner was engaged to the academic French painter William Bouguereau for nineteen years. Nineteen years! What woman would want that? Well, Bouguereau’s mother did not think it would be good to have two artists in the family, so they waited until she died to get hitched. This was not, however, nineteen tortured years of yearning. Elizabeth always lived across the street from or next door to her fiancé. He was the earth and she was the moon. Bouguereau’s work was in demand from his American patrons, so if you didn’t want to wait, or pay his fee, why not buy a painting from that lovely American student of his next door? The way I see it, the nineteen years of waiting were ideal. She had the companionship of the man she loved, and she had total freedom to paint without having the distraction of running his household –all of the fun, none of the housework! Sign me up! When they did finally marry, she put aside her paints to tend to him for about a decade. It would have been a terrible shame if she had been forced to do that earlier. Most of the Stiffs are at a writer's workshop today with author Victoria Thompson. In the meantime, feel free to read through the archives. We'll be back on Monday. Sadly, my girlfriend broke her hand on the job last week, and after surgery she’s going to be laid up for an entire month. She’s been working and studying hard to be a chef and had recently gained an externship at The Broadmoor, a five-star hotel in the city we live. This externship is a big deal, not only for her, but for her friends and family, who have missed her delightful company over the past two years. What’s equally tragic about her story is that with three adult boys, like many writers out there, she waited until they were grown to fulfill her passion. To prove this point, I became a roving reporter and approached some authors I admire and asked them the following: Did maturity and age help you in your writing career, or do you wish you’d started earlier? Interestingly enough, no one claimed to have properties of fast-rising yeast. After I finished my Master's program at twenty-five, I read a lot of contemporary romance. Theoretically, I could have started my writing career for Silhouette at that time, had it occurred to me then. However, between twenty-six and twenty-nine I had a third baby and then a set of twins, so time might have been an issue! As it turned out, I started writing when my twins turned four. When I sold my first manuscript two years later, I avoided selling on proposal for a few years, simply because I didn't want the demands of my second career to interfere with time spent with my kids.Every person goes through stages in their lives, and every stage brings a different level of insight, different perspectives. There's no doubt that experience brings deeper introspection and that directly impacts our ability to develop characterization. Things tend to appear more black and white to us when we are younger. Age brings an understanding of the shades of gray, and the complexities of human nature. That understanding and our ability to convey them in our plots make us better writers.I know that I couldn't write the edgy suspense I'm writing now while in my twenties. That took years to hone. And I don't think I would have been comfortable tackling some of the gritty elements I include in my stories now. I guess it's good to know that there's at least one thing age and experience are good for! Being a writer has always been my dream. When I was 13, I wrote to Stephen King and told him I wanted to be a writer when I grew up (after I gushed over THE STAND.) He sent me a postcard that said, "If you want to be a writer, write." It took me nearly twenty years to get serious about my writing. I had over 100 beginnings and no endings. But after a day care scare with Brennan #3 (then 8 months old), I was determined to finish one of my stories. Ignorance IS sometimes bliss: I thought getting to "The End" was the hardest part of getting published. But I've typed "The End" 15 times: on four never-to-be published novels, six published, two in production, two short stories, and a novella. My inspiration is my dream--this is what I've always wanted, the one and only thing I've ever done solely for myself from the beginning. I don't think I would have sold before I turned 30. My stories were juvenile at best, but even more important than that, I didn't have the discipline to learn how to be a better writer, or the patience to make sacrifices. When I was twenty, television, socializing with friends, going to the movies, weekend trips, all held far more allure to me than sitting at a computer everyday writing. Writing was a hobby. I also think that making friends, getting married, having children, building a career, and becoming immersed in day-to-day living has helped me develop insights into human psychology that are invaluable to my stories. After college, I immersed myself in three years of volunteering. Working in the Hispanic community, I began seeing all sorts of possibilities for characters and stories. During a brief stint working as an Occupational Therapist aide in a hospital in Lancaster, California, I met a young boy named Rafael who would later become the basis for my first novel's main character, Gus Gonzalez. 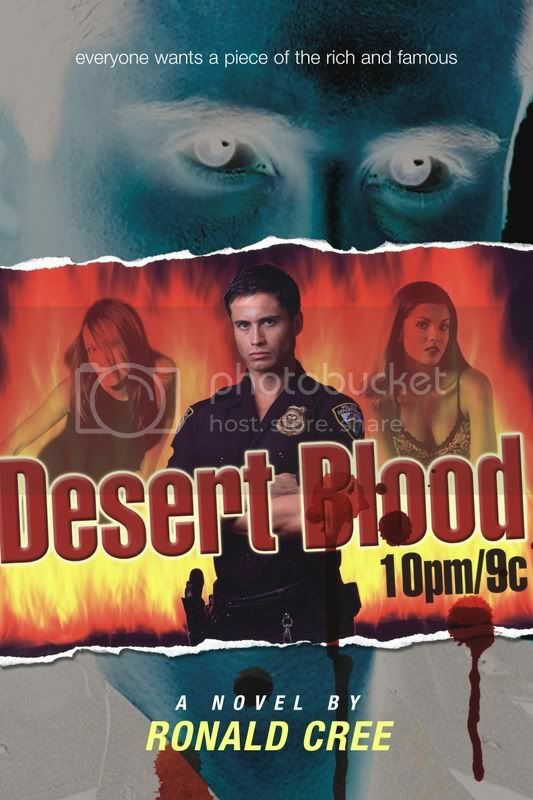 Years later, I was assisting a number of Hollywood actor friends with their professional websites--including The OC's Nicholas Gonzalez and Desperate Housewives' Eva Longoria--when one of the stories in my head finally gelled and Desert Blood 10pm/9c came to life. I think a lot of us wish we were sold earlier in our lives, but I honestly don't think my books would have been nearly as emotionally fulfilling. My career as a nurse has dramatically helped my writing, not just because I write medical romances (although that certainly helps in writing my medical scenes), but because of the insight I've gained into people's thoughts and feelings. Great characters are the mainstay of every story and meeting people, learning about them, is key to writing great characters. When I get stuck with heroes and heroines who aren't doing what they're supposed to do, I feel very lucky to have the ability to go to work, meet some of my patients and their families. This invariably makes me realize exactly what I need to do to help my characters move the story forward. I wanted to write fiction when I was younger, but I didn’t have anything of interest to say. By the time my children were teenagers, I suddenly had lots to say! Not only had I been tempered by my sons and difficult husband, but I began to understand the dynamics of my parents, siblings and friends as well. Then there was my career as a Realtor. I got involved in the lives of so many interesting people, and the stories began to spin in my head. I realized I’d been studying people all my life, trying to understand their motivations, their fears, their passions and more. And I developed the discipline to get up an hour earlier every morning, cuff my ankle to my chair, and spend an hour writing before work. That kind of steady output finally got me published. In my case, writing required an amount of maturity that I just didn’t have in my twenties and thirties. Thanks very much to the wonderful authors who shared their insights and for affirming when it comes to writing, age might actually be an asset, and to my friend Fran Gleason who unwittingly provided the impetus for this blog. As for all of you out there, I’m curious. Has age helped or hindered your careers? Maybe you can provide a different slant. And to Fran, like everything you do in life, you’ll sail over this in your magnificent fashion and emerge even stronger and better. Some of you may recognize this blog. It was originally posted last year about this time. I'm recycling it for lack of an interesting subject this week. Huh? Why, everyone knows when Halloween is, you might think. October 31st, right? Well, for most people it is. But not, apparently, for these callers. Believe it or not, every year I get at least a half dozen people calling to ask that question. I always say, as politely as possible, “October 31st.” After that, I usually get some explanation of why they asked such a stupid question, like other places have Halloween on different days. This is the point where I want to scream. I could explain to them that Halloween is always October 31st, and some places might trick or treat on another day, but Halloween doesn’t change dates. Not being one prone to verbal excess, however, I keep my mouth shut. The calls that come into the station are all non-emergency calls. (The emergencies go to the Allegheny County 911 dispatch center.) Most of them are people calling to talk to one of the police officers to file a complaint or report something minor. Some are from insurance companies requesting accident reports. Sometimes I get calls from confused elderly people (one woman complained that the police were at her house stealing her windows. They weren’t.) None of these calls bother me. It’s part of my job, even though I’d get a lot more done if the phone wasn’t ringing every couple of minutes. The ones that irk me are the stupid callers, or the ones who are too lazy to find the information themselves. At least a dozen calls a day are from people who say, “I didn’t want the police. I wanted the township office,” like it’s my fault they dialed the wrong number. I politely give them the correct number, but I’d really like to tell them to learn how to read the *@%$ !#* phone book. Yesterday I had a call from a guy who asked when the garbage company was picking up the leaves. I told him I had no idea and suggested he call the garbage company. Then he asked me for their phone number. If you happen to be driving through Shaler in the next few weeks, just ignore the screaming banshee you might hear. It’s not a ghost or goblin coming after you. It’s only me—the normally sedate police secretary who just received one call too many. Last week, a 76 year old woman became my hero. Virginia Hart told reporters she was having a bad day when a young woman entered her store in scenic Lone Pine, pulled a gun, and demanded money. Not willing to give up her hard-earned cash, Virginia pushed the gun aside and picked up a stool. The girl told her she wasn’t kidding and Virginia replied that neither was she. Lee has taken me to task in the past for defending an old high school chum for taking the law into his own hands and shooting an attacker who had beaten him with a ball bat. In this case, an elderly woman with a stool was defending her property against an armed robber. So I think I’m safe when I proclaim Virginia as my kind of lady. I’m not saying that anyone should refuse to give up mere money when faced with a gun-wielding thief. I’ve worked retail. No way would I have risked my life for what was in a cash drawer. But I don’t think that was what was on Virginia Hart’s mind. She was mad that day. She didn’t feel well. She’d owned that store for 20 years and worked hard for what she had. The would-be robber had not worked hard for that money. She just wanted to take it. The girl was lazy. It was the principle of the thing. I have to admit it…I’ve had days like that. Don’t mess with a woman when she’s crabby. My husband will tell you. It can get ugly. What I especially like is the message Virginia sent to the young thugs of the world. Stop bullying old people. Stop assuming that just because someone is older and female, that you can walk all over them. Get a job! And don’t bother trying to rob the market in Lone Pine. You’ll get beaten with a stool. Virginia commented that it wasn’t anything exceptional. I beg to differ. In today’s world when the strong expect the weak to just roll over and give up, when they prey on the elderly because they’re easy marks, Virginia Hart has shown that good can triumph over evil. And that some days, old and cranky trumps young and stupid. Virginia Hart, you are my hero. I began working on a new mystery a couple weeks ago. I hadn’t planned to do that—after all, I had a finished draft that needed some writerly attention. But, one day, out of the blue, a new character decided to take up residence in my head, strutting his stuff, making noises, trying to get noticed. I noticed him all right. In fact, I took an immediate liking to him. He sparkled in my imagination, and, with some work would, I know, sparkle on the page. I could see the good and bad in him, his complexities, his contradictions, his possibilities. I could see him making a mess of things for my two recurring protagonists, Greg and Andre. I envisioned him as an instigator and a foil, a suspect and, maybe even a victim. I named him DeShawn. Soon, he wasn’t alone. Thoughts of a flamboyant DeShawn begat thoughts of a domineering Ulysses and his cheating lover, Simon. Then the overprotective Patrick and conniving twin sister, Pauline, joined the party. The unhappy Vaughn and the drifting Jeremy (and their son, Brett) added to the growing noise in my noggin. Before I knew it, my head was cluttered with an entire town of chattering, attention-grabbing characters. There was only one problem: They didn’t have a story. Well, they do now, at least the start of one. Day by day I’ve been plugging away at the plot for "Death in a Food Fight." Seems a key plot point needed a new character, so the strong-willed Alma Threadmorton was born on the page. Sure is getting crowded in that town of mine, but it's still early in the process--and, besides, one or two of them have to die! Some of you are probably shaking an admonitory finger at me, tsk-tsking that I should be reworking the finished manuscript, not creating a whole new story. You’re probably right, but, hey, I’m having too much fun filling in the blanks in my characters’ lives, drawing the connections that link one to another (and a third or fourth), creating complications and conflicts, designing homes and workplaces, laying out the murder scene, picking the weapons or murder methods, and delighting in all the minutiae on which the story will be built. Revising the first manuscript is too much like work to me—I get all the work I need every day at the office. Oh, some day I will need a break from DeShawn and his shenanigans, and I’ll use that time to work on the languishing manuscript. But, for now, I’m just going to enjoy myself and figure out just what kind of trouble I can make for Greg, Andre, and DeShawn and the rest of the cast. Have you ever had to make the choice between “fun” and “work”? What did you do? Go play in the sandbox or get behind the ol’ grindstone? The Working Stiffs are excited to welcome Alison Gaylin, author of TRASHED, as our guest blogger. Alison is a journalist who has covered the arts and entertainment for more than fifteen years. Her first novel, HIDE YOUR EYES, debuted in March, 2005 with nearly a quarter of a million copies in print and was nominated for the prestigious Edgar Award for a first novel. The sequel, YOU KILL ME, was published in 2006 to rave reviews. Find out more about Alison at her website. Recently, I was speaking to a library book club about my new book TRASHED. They were a very intelligent group of women, and they’d all read the book – about a young supermarket tabloid reporter who uncovers a grisly series of Hollywood murders. I was told they really enjoyed it, and they had a lot of questions for me -- so I kept the talk pretty brief, then asked if there was anything they wanted to know. But this is what I get for having a day job at a celebrity gossip magazine. Everybody says they couldn’t care less what’s been going on in the lives of Britney, Lindsay, Brad and Angelina, but secretly they do. They really, really do. It’s why In Touch, where I serve as articles editor, has a circulation of over a million. It’s why, when I tell people what pays my health insurance, the fact I write crime fiction is comparatively boring – even if it is crime fiction about celebrities. The interesting thing is, the stars that sell the most In Touch covers – the ones people want to know the most about – they’re usually not the ones who are topping the box office charts (Brad Pitt accepted) or winning Grammys or Academy Awards. The celebrities who sell magazines are the ones who behave badly – who drink too much or cheat on their wives or drive on the wrong side of the freeway at three in the morning. The ones who prove that, no matter how great you look or how much money you have, you can screw things up just as royally as the next guy. Now that is something to daydream about…. PS. I wouldn’t be a very good gossip writer if I didn’t leave you with a blind item, so here goes: This hunky star’s killer smell made more of a lasting impression than his killer smile – when, during a wild party weekend, he forgot to bathe or change clothes for days. Can anybody guess who? This past Tuesday, October 9, was my birthday. My 44th birthday, to be precise. The day was not helped in any way by my suffering both the flu and PMS. Those double fours sound so squarely middle-aged. And there’s this thing I have with my mother. If she were alive, she’d be 66. But instead, she was killed in a car accident by a drunk driver 17 years ago. So she’s forever 49. I’m only 5 years younger than my mother. I’m as close in age to my mother as I am to my only sibling, my 5-years-younger sister. On the other hand, the flu passes, PMS passes, and you can’t freak out about your age forever. For starters, I’m not the queen of healthy living, and I’ve seen firsthand what two of my grandparents were like in their late 80s. Therefore, I neither expect nor aspire to reach 88, so at 44, I’m probably already well past middle age. That takes some of the pressure off. Second, 44 probably isn’t as bad as 45, 46, 47 or 48 will be. And I’m sure it isn’t as bad as my 49th birthday will be, because I fully expect my head to implode or something equally dire to occur that day. And that makes me normal, according to Hope Edelman, author of Motherless Daughters, who says that deep down inside, a lot of women find it impossible to imagine living longer than their mothers did. And normal’s good. On that note, I’m feeling positively perky. I’ve got 5 good years left in me. Might as well enjoy them and not waste them moping! How about you? Ever had a really bad birthday? I’m sure by now everyone has gotten one of the infamous Nigerian e-mails at least once. One of the many versions begins with “Request for urgent business relationship.” It goes on to say that they are government officials with money in the Central Bank of Nigeria. There is 21 million dollars that they can’t acquire and need your help to do it. All you have to do is send them your bank account information and part of the money is yours. Unfortunately, once you do that, there will be delay upon delay-the money is held up, they need another $5000 to bribe an official, etc. Before you know it, you’re bouncing checks all over the place. Your account has been cleaned out. Another scam involves a man who wants to give his fortune to a church. All the church has to do is send him enough money for him to be able to send his millions to them. Another one is the scam where the victim is told he won a foreign lottery (that he never entered). He has to send a processing fee of a mere few thousand dollars first. One of the newer scams is the e-mail from a hitman. Yes, you read that right. Someone has hired a hitman to take you out. All you have to do is send him money and he’ll forget all about it. I find it hard to believe that anyone actually falls for this stuff, but they do. We had an elderly couple come in to the police station not too long ago who were out about $10,000. We had someone come in with a hitman letter too. He was smart enough to know it was fraud. In the Pittsburgh Post-Gazette the other day, I read about the newest scam: The Nigerian Puppy Scam. In this one, someone sees an ad for a free or inexpensive puppy. They call the number and find out that the puppy is a rare breed that would normally sell for thousands of dollars, but they can have it for a mere pittance. They send the money. The seller says there are problems and they need more money for shipping or insurance. In one instance the seller stated the plane carrying the puppy had crashed and they needed money for the vet bills. Warnings have been sent out by the American Kennel Club and the Better Business Bureau for consumers to be aware of these scams. How many of you have heard of these scams? Do you know anyone who actually fell for one of them? Are there any scams you want to tell us about? I've already blogged about many of the jobs I held as an undergraduate. Most of those jobs I had to go looking for, through postings at the student employment office, or ads in the Pitt News, or word of mouth. This job found me. I was sitting with a few other students in the Tuck Shop, a coffee-and-snack area in the Cathedral of Learning [Isn't that a great name for a college building? ], when the Dean of the School of General Studies came over to our table. He had some extra grant money left over that he had to use up, so he offered us jobs! As part of the Administration of Justice Program, we got to work part-time that summer at a half-way house for pre-release state prisoners. Men who were deemed not-too-dangerous and who had finished most of their sentences in penitentiaries were sent to live in an old run-down mansion on Pittsburgh's North Side for a few months to readjust to the free world. They were still technically prisoners, so they couldn't come and go as they pleased; instead, they were expected to find jobs and come back to the halfway house after work. There were unannounced searches and drug tests but, all in all, the residents seemed to agree that it was better than prison. My job involved helping to repaint the place and hanging out with the inhabitants, most of whom were interesting to talk to. We played a lot of pool. They mostly talked about how they'd been unjustly convicted or, if guilty, given unjust sentences. There was also a class connected with the program. I did a study of educational opportunities for ex-convicts and compiled a looseleaf notebook of schools and training programs in the area, all of which had provided details of their offerings and requirements in response to my questionaires. The most exciting thing that happened was a student field trip to Muncy, a woman's prison. A tire blew out on the car I was riding in -- no injuries, thank God. Then one of the other students and I went into a small gas station Ladies Room where a terrified bat was flying around. We managed a rescue -- catching it in a large paper cup -- but it took awhile. Meanwhile, a woman (not part of our group) was banging on the door. We kept saying, "Just a minute," and she kept banging. She was pretty grumpy when we finally came out, but then, when we opened the cup and released the bat, she was astounded. She watched us walk back to our group with her mouth hanging open. I guess it was an interesting summer after all. If I had to pick one image to describe how I create my stories, I would picture a professional gas range with all kinds of pots and saucepans steaming, simmering, and bubbling away. Occasionally, I lift a lid to check on things, and maybe give an idea a stir or turn down the heat until I’m ready to serve it up. I usually have two or three stories cooking away at the same time, and I’m as surprised as anyone to discover the finished dish: sometimes it’s chicken, sometimes it’s fish, sometimes it’s cold fruit loops in a bowl. Something happened to me on my latest story that has never happened before. There I was, merrily writing away, when I came to a fork in the road. My writerly side insisted that I follow the storyline down the path I had mapped out – and write it out in full – while my editorial side spoke up to mention that this bit was actually backstory and that it would have to get trimmed out of the final – so why didn’t I save myself the time and trouble of writing it down and simply skip past it now? It was the strangest feeling. I felt like I was straddling the divide between my creative and editorial sides and getting pulled in two directions, like a referee. In the end, I compromised, (if you can compromise with yourself) and wrote out the backstory. I wrote it thinly, not spending a lot of time on it, just following the narrative line and eliminating any descriptive detailing that usually costs me time. The storyline turned out pretty much the way I had envisioned it, and when it was done I put my editorial hat on and took a good hard look at it. The bit didn’t reveal anything new about my characters; it didn’t provide any new motivations for their actions that we didn’t already know about, and it certainly didn’t add any new details that I hadn’t already planned on revealing later in the story. So, ruthlessly, bravely, I deleted it while it lay there breathing on the slab. When I originally conceived the idea, I had decided to create something around 5,000 words. While I was working on the story, I think the editorial part of my brain was performing an unconscious word count for me, and my brain was warning me at the split that I was nearing my word limit if I wanted to keep the story tight. If this is true, I’ve added a new trimming tool to my repertoire, and more importantly, I’ve learned to use this tool at the beginning of the process instead of at the end. Any other word chefs out there? What tricks or tools have you discovered? Perhaps you’ve heard me say that caffeine and Clorox are my only real friends. I came up with this theory years ago while cleaning my hundred-year-old house. I decided that caffeine and Clorox both delivered broad-sweeping, dependable results, and could therefore be relied upon with more confidence than most people. This week I added a third friend to my list. Here in Pittsburgh, summer just refuses to end. The horses are growing their winter coats. The trees are turning bright colors. The days are shorter. Still, everywhere I go, and everything I do, my clothes are stuck to me. Sweat runs down my back and trickles along my sternum. It’s most unpleasant. I won’t even bother to recount the wardrobe challenges in my fall social calendar thus far. Worst of all, my make-up just melts on my face. I am tired of walking in the door after hours of laboring under the delusion that I was even a fraction as presentable as when I left. Clothes are rumpled and creased. Armpits are damp. Feet are swollen. My face looks as if I’ve dipped it in the aftermath of the Exxon Valdez. I formulated a battle plan just in time. I have switched to Cornsilk pressed powder. It has mysterious oil absorbing properties that I prefer to think of as magic because I don’t want to know what is in it. It could be corn STARCH for all I care. Last Thursday, we attended an event, along with 698 other people, in an airplane hanger sans air conditioning. Luckily, it had several days in a row of eighty-five degree weather to heat up like a pressure cooker and replace all oxygen with humidity. Otherwise, the tropical feeling would not have been complete, and it is pitiful when something is done half way. Thanks to my new real friend, Cornsilk, my face, along with my shoes, was one of two survivors. My clothes will have to go in the trash as they were cocktail attire, NOT moisture wicking performance gear. I would love to wax poetic about Indian summer, but I have to go stuff ice cubes in my bra so I can give a presentation to teachers in a high school classroom. You guessed it. No air. There's a lot of things that you need to learn to be a therapist. You need to be able to assess people as to the type of problem they have and how bad it is. You need to be able to find ways to talk to people about their problems that allow them to feel comfortable and safe enough to discuss the things they wouldn't outside the room, and yet not so comfortable that they never "get down to business." You need to have some sort of understanding of what makes people better, and the pitfalls which keep clients from getting there. I'm not just trained in the process of a one-on-one therapy session. My degree is in organizational psychology (read, "psychology of organizations," not "psychology of organizing things.") Because of this, I look at the way groups interact and decisions unfold in organizations. One of my client's used to talk about getting a, "bird's eye view" on life. That's the way I think of it: looking at the big picture of how things get done in an organization. The therapists in the unit down the hall from my office are having some problems. There's a "partial hospitalization program" where patients come 3 to 6 days a week. The building just behind us houses a live-in "respite" program, for clients who need extra help to stay out of the hospital. Those clients live together and eat together, and come over as a group to attend the partial hospital program. As you might imagine, the respite clients can change the process in the partial hospitalization program. Some days they make up half the people there. That's where I come in. I organized a role play with the staff on this unit, to give them the "feel" of how the group process has changed. I gave half of them a big green "D" to wear around their necks, and asked two of the supervisors to lead them in a group-building activity. The non-Ds I asked to stand out in the hall, and invited them back into the room one by one. It was easy to create the phenomenon of feeling isolated as a non-D in the "D" group. It was so powerful, in fact, that when I reversed roles, asking the "D" group to stand out in the hall, the non-Ds weren't really able to coalesce as a group. A pretty powerful effect, to have occurred after 15 minutes of role play! I've been thinking how designing role plays is similar to writing fiction. Most of us get our ideas, in one way or another, from real life, and we condense them into a plot and theme for our novel. Then, we have to figure out how to represent these ideas in the form of characters and action, to allow readers to feel the conflict, not just think about it. Sort of like how I created my role play, so the therapists could feel the group process, not just think about it. How do you, as a writer, help readers feel your work? We all know that as crime writers, we need to be cautious of the crime shows on television and how they portray investigations. (Just read this book to find out why.) But I will say that I still watch these shows, particularly the original CSI series on Thursday nights because I think we can learn something from them. I pay close attention to character development and criminal motivation. I think the show does twists and turns well and depicts some rather creative criminal behavior. 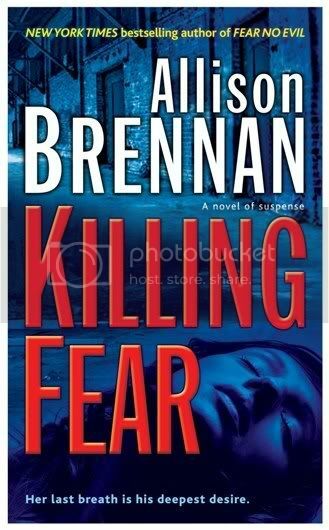 With all the different crime shows available on television these days, it’s amazing to me that people are even reading mystery novels anymore. I’m thankful they are, don’t get me wrong, but I wonder if television has gone too far, crowding the market with so many crime shows that people are either becoming too desensitized to death or overloaded. Or maybe all this attention on murder and investigation is serving a good purpose, forcing people to pay attention? What do you think? A few years ago, there was a reality television show called Murder in Small Town X, which had me totally hooked. I’m not a fan of reality television, but this one was good. Contestants were chosen to investigate a fictional crime that happened in a small town. The suspects, or townspeople, were all actors. At the end of each episode, two contestants were randomly chosen to search for the killer alone at remote locations based on clues, their actions chronicled by head-mounted cameras. One of the contestants would be confronted by the killer and “killed” off the show. It was a real nail-biter, and I loved every minute of it. The murder story and plot became more complex with every episode. But this show had a sad ending in real life. The winner, a man named Angel L. Juarbe, Jr., a New York City firefighter, solved the crime and won the million dollar prize. A week later, he was killed in the World Trade Center attacks on 9/11. What worked about this show for me was that the writers of the show didn’t need to rely on fancy technical forensics or flashy gadgets to be entertaining. This was about ten ordinary people having to use their brains and basic sleuthing skills to solve a crime, much like how the amateur sleuths of our novels get the job done. So, do you watch crime shows? If so, which ones? Do you learn anything from them? This week I've been following the murder trial of Leslie Mollett, who is accused of murdering Pennsylvania State Trooper Joseph Pokorny on December 12, 2005. Nine minutes after pulling a car over for speeding, Cpl. Pokorny was shot and killed execution style with his own weapon. According to the prosecution, the defendant was stopped with two other passengers by Cpl. Pokorny. A scuffle between the officer and the defendant ensued, and when Cpl. Pokorny used his OC spray, the defendant grabbed the trooper's arm and directed the spray back at him. The defendant then took Cpl. Pokorny's gun and shot him. The first shot went through his side (missing his vest) and through both lungs. Cpl. Pokorny then dropped to his knees and put his hands in the air. The defendant then shot him in the back of the head. Witnesses who were in the vehicle with the defendant took off when the scuffle began, but heard the shots fired. One witness stated that the defendant then called him on his cell phone stating the officer "got three to the head." One of the things that makes my skin crawl(other than the murder itself), is the defendant's lawyer playing the race card. He seems to think that since the victim was white and the defendant is black, it makes everything okay. It doesn't matter that there's a ton of physical evidence, DNA, etc. He doesn't want people getting "caught up in the undercurrent of emotion." Right. For more details on the case, including the Affidavit of Probable Cause see this link to the Post-Gazette coverage. If you have the stomach for it, listen to Cpl. Pokorny's last radio transmission. Cpl. Pokorny was a seasoned state trooper with 22 years of service. He was well aware and well versed in the dangers involved in what most people would call a routine traffic stop. There is no such thing as a routine traffic stop, or routine anything in police work. According the the National Law Enforcement Memorial website, "A total of 1,649 law enforcement officers died in the line of duty during the past 10 years, an average of one death every 53 hours or 165 per year. There were 145 law enforcement officers killed in 2006." I know that not every police officer is a candidate for sainthood, but most of them are not in it for the glory, and certainly not for the money. Most of them really do want to protect and serve. Let me just say that I am neither for nor against legalized slots. I don’t have even the slightest interest in feeding my hard earned nickels, quarters, or dollars into some flashy machine. Yet I can understand the intrigue of the world of casino gambling. 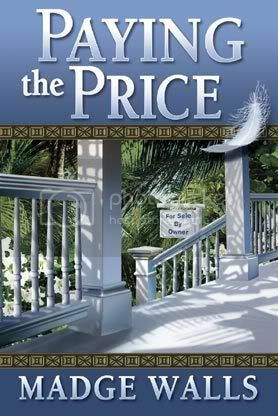 My first suspense novel (the one locked away never to see the light of day again) was set in a fictional casino in Las Vegas, although I’ve never been there. I did my research at Mountaineer Racetrack and Gaming Resort in West Virginia where slots have been legal for years. Rows upon rows of mechanical bandits cast an eerie glow onto the faces of mostly elderly gamblers. The massive rooms have very little illumination except for that emitted by the slot machines. The folks pushing the buttons (you don’t even have to pull a lever anymore) appear to be hypnotized by the lights and the constant otherworldly musical tones that hum in the background. One thing I found especially curious was the way many of the gamblers feed the machines. You don’t necessarily have to pump coins into them. Instead, these folks had plastic cards attached to their clothes by a coiled plastic cord. The cards then fit into a slot in the machine. They virtually PLUGGED themselves into the mechanical beasts and let them bleed them dry electronically. It’s definitely an interesting way to spend an afternoon. We spent one whole quarter. But my husband, ever the tightwad, refused to spend any more when the machine ate that one coin without spitting more out as a reward. And now slots have crossed the state line into Pennsylvania. Have I been to any of the new casinos? No. Why should I? I hang out at the barns of Mountaineer racetrack all the time. If I were inclined to gamble, it would be easier to drive across the parking lot while I was there than to make a special trip to one of the new ones within my own state. Apparently, no one thought to spend much time in West Virginia when planning the invasion of slots to Pennsylvania. Otherwise, they’d have learned a few things. For example, when legalized gambling came to West Virginia and the old Waterford Park evolved into Mountaineer, promises were made to improve the facilities and to increase the purses of the races. For a time, money did flow to the horsemen. But then it gradually dwindled. Recently I overheard a conversation on the backside (barn area) in which a trainer grumbled that behind the casino, it was still just Waterford. Barns crumble; the track surface leaves much to be desired. The money just doesn’t make it that far. And lately the Pittsburgh news has been filled with North Side residents screaming because, not only is a casino planned for their neighborhood, but now a gentlemen’s club or two is in the works. Hey, folks, take a drive to West Virginia. The property across from Mountaineer is gradually becoming glutted with strip clubs. One thing just naturally follows the other. If there is one thing that Pennsylvania seems to be doing right, it’s limiting the amount of slots licenses it’s handing out. At least so far. In Weirton, every neighborhood bar is now a “club” lit with neon and filled with slot machines. Even the local ice cream shop closed down to make way for more slots. As a mystery writer, the world of gambling offers a myriad of possibilities. However, I’m really happy that for the moment, it hasn’t invaded my own backyard. What do the rest of you think? Will slot machines eventually result in tax cuts? Or will the moral fiber of our fair state erode with their presence here? Have you been to one of the new casinos yet? Do you plan on going? 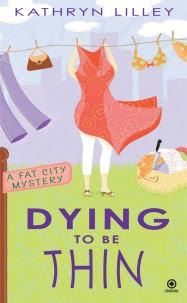 WS: Today’s guest is Kathryn Lilley, a multi-published author of young adult books who makes her adult mystery debut on October 2nd with DYING TO BE THIN, first in the Fat City Mystery Series. Hello, Kathryn! WS: Can you tell us a bit about DYING TO BE THIN? Kathryn: Plus-sized TV producer Kate Gallagher has often been told she has the “face” for TV—it’s the body she needs to work on. So when she gets dumped by her boyfriend and laid off from her job in the same week, Kate decides to trade in her Whoopie Pies for thinner thighs and enrolls in an exclusive weight loss clinic (read: fat farm). WS: Where did you get the idea for the series? Kathryn: As a pre-teen, I had two passions: Nancy Drew mysteries and Pralines ’n Cream ice cream. So I guess it was inevitable that I grew up to write a series called the Fat City Mysteries! WS: What’s coming next in the series? Kathryn: Right now I’m finishing up A KILLER WORKOUT. When Kate’s TV audience ratings go down in the “cosmetic” area, she gets sent to a boot camp to do a little emergency downsizing on her derriere—only to wind up sugar crashing it into a gruesome crime scene! WS: So except for the readout on the scales, one could assume that your books are on the “lighter side”? Kathryn: Whatever gave you that idea ?